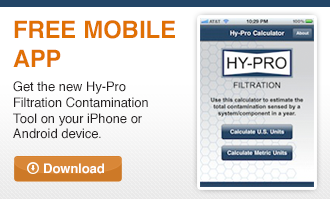 Get the full support of Hy-Pro Nation. Together with a global distribution network our expert team of Hy-Pro technical field sales engineers are ready to implement proactive strategies to solve hydraulic & lube oil and diesel fuel problems. Experienced in lubrication, filtration and fluid power they carry the highest industry certifications including (CFPS and CLS). Our engineering staff is ready to support your application needs with expert product & industry knowledge to make condition based recommendations for standard or customized contamination solutions. Rely on Hy-Pro's customer service team to put a personal touch on your rush requests and anything else that you might need including up to date order status, product availability and pricing quotations. We're not satisfied until we exceed your expectations. Innovation is at the core of Hy-Pro Culture. Serious problems require serious solutions and at Hy-Pro we have developed a full range of products that are proven to handle industry's toughest contamination challenges. A commitment to developing new products while continuously improving existing products is what makes Hy-Pro a leader. Contact info by location is listed below or contact Hy-Pro Filtration U.S.A. +1.317.849.3535 or info@hyprofiltration.com.